Beans belong to the family of crops referred to as legumes. 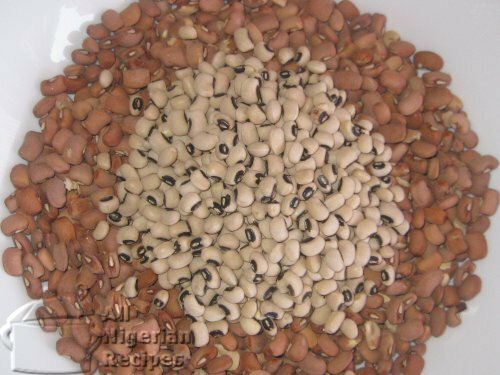 There are many varieties of beans but the type used in preparing Nigerian beans recipes are the kidney shaped black eyed beans and the brown beans. Beans is mostly cooked to make a variety of recipes. Sometimes the beans coat is removed in the process of preparing the recipe. Here beans is cooked on its own with added ingredients. Variety is achieved by adding Yam, Plantain, sweet potato or baby corn. This is one of those recipes that were derived to reduce the flatulence associated with beans. As the name implies, 2 major staples are used in cooking this recipe. In this recipe, beans is boiled and fried in red palm oil. It has a very traditional taste. The beans coat is removed by a special technique and the beans blended and cooked with ingredients. These days, some people do not peel the beans before preparing this meal especially when using brown beans. It can also be prepared with beans flour. Another version of Moi Moi which is cooked without any ingredients, usually eaten with stew. It is suitable for vegetarians! This is another Nigerian food recipe where beans coat is removed, the seeds blended and deep fried to make balls known as bean cakes. It is a very popular breakfast meal. Also known as Beans & Stew. Is is a good way to enjoy beans even if you are not a fan of beans. It tastes oh-so-good with soft, stretchy bread. In this beans recipe, the beans coat is also removed and the beans cooked as in Beans Porridge. Flatulence, indigestion and bloating are the limiting factors for the consumption of beans. This has made beans so unpopular and caused a lot of people to abandon many nutritious beans recipes. Beans contain oligosaccharides, the sugar molecule that requires special anti-oligosaccharide enzymes which is absent in the human digestive track to properly digest it. The incomplete digestion therefore produces gas which causes discomfort and flatulence. Some cooking methods and practices that can help reduce these sugar molecules in beans are detailed in How to Reduce Beans Bloating. Bean is available all year round in Nigeria. A substantial quantity is cultivated in northern Nigeria. Beans are best stored in airtight containers to prevent weevils from attacking them. They can last for months if properly stored. Beans are sold in the open Nigerian markets or African food stores all over the world. In the open Nigerian markets, they are sold in big bags in whole sale departments but sold in small cups as retail. Outside Nigeria, beans are often sold is small 1 kg packets. When buying beans, it is best to look out for the onset of weevil attack. Small holes on the beans seeds is a good indication of this. Also, you will notice that the grains are dusty as a result of the weevils boring into the seeds. Beans have significant amount of fibre, protein and iron. They are considered as healthy food because they contain lots of beneficial nutrients.